When it comes to understanding pallet rack capacities, beams are relatively easy and straightforward. Manufacturers list their capacities per pair, and it's straightforward - a 5,000 pound pair of beams (front and back) can support exactly that, assuming that the load is evenly distributed and there aren't other factors like decking, unorthodox loading methods, or ties in play. Because there are more variables, upright frames are more difficult to specify when it comes to load capacity. They depend to a great extent on the vertical air space between levels, or more specifically the air space of the tallest rack level. More beam levels usually mean that the rack has more capacity, although material strength can come into play for very short, dense and heavy loads. This air space between levels is called the unsupported span. The more air space in the rack, the less its capacity. More beam levels means your rack can usually hold more total weight. 48" vertical spans are very typical in pallet storage applications, although that can change for tall, light loads or very short, dense loads that require more structure to carry. The key thing to remember is that any length of unsupported span limits the entire rack. For example, if you have a space between your floor and the first beam of 60", that's the number that limits your upright (and total rack) capacity. It doesn't matter if the beam spacing is 36" between all other beams. Only that 60" matters when you calculate your pallet rack's load bearing capacity. If you exceed what your manufacturer tells you the capacity is, based on that 60", your rack is in danger of a collapse or other serious accidents. Pictured: left rack can hold more than the right one because it has more beams and less vertical space between them. In general, this is the case, but you should always check with a qualified rack provider when specifying racks for heavy loads or with beam spacing greater than 48". All rack manufacturers post their upright capacity tables, or provide them in printed form. These tables compare the type of upright to the vertical beam spacing, and tell you how much the frames can hold in total. This is independent of what the beams can hold, but will obviously need to be stout enough to carry fully loaded beams. For assistance with your rack capacities, contact Cisco-Eagle. We urge you to contact us if you are not completely certain about the needed capacity for your application. We also welcome your telephone calls to Customer Service. Check to see what specification is being used in a rack capacity table. (RMI 2008 Design Specifications are one of the most recent). System compliance includes consideration of connections. The great array of potential beam and column combinations cannot be represented in a chart format, so for verification of system compliance to RMI 2008, or conformance to other local or regional codes, please consult us. When you purchase rack, be sure that your provider can give you capacity information for the beams and for each bay based on upright strength and beam spacing. Capacities are based on interior usage. Capacities are applicable for non-seismic use. Consult us or another qualified racking company for seismic applications. All columns/posts must be anchored to an adequate concrete floor, as required by RMI code. Capacities are based on installation in a plumb condition. 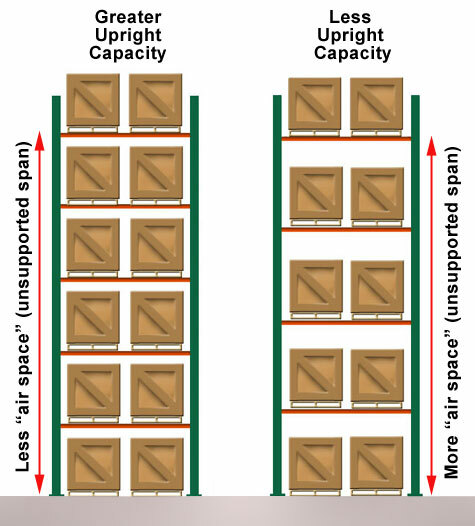 Capacities are total per upright frame, assuming equal loading on both posts. If any of the above conditions do not apply to your application, consult with Cisco-Eagle for design information. Safety Factor = 1.8:1 per AISI 2005. Capacities are to be reduced to account for the weight of the rack system; deduct the weight of beams, frames, decking, and accessories. Other frame capacities are available for applications with large quantities; consult us. RMI 2008 recommends the use of protective equipment to reduce damage to frames. Items including column protectors, double columns, and guard rails are available. Determine the maximum distance between levels, or the distance from the floor to the first beam level, whichever is greater. This dimension is the "vertical beam spacing" referred to above. Using the vertical beam spacing, as determined in Step 2, follow the appropriate row towards the right until you find a capacity equal to or greater than the capacity required, as determined in Step 1. You may wish to choose an even greater capacity upright, for additional abuse resistance. Verify the adequacy of your floor to support these loads. Please contact us for questions about high capacity or tricky applications. We can help you specify the correct upright for your load.